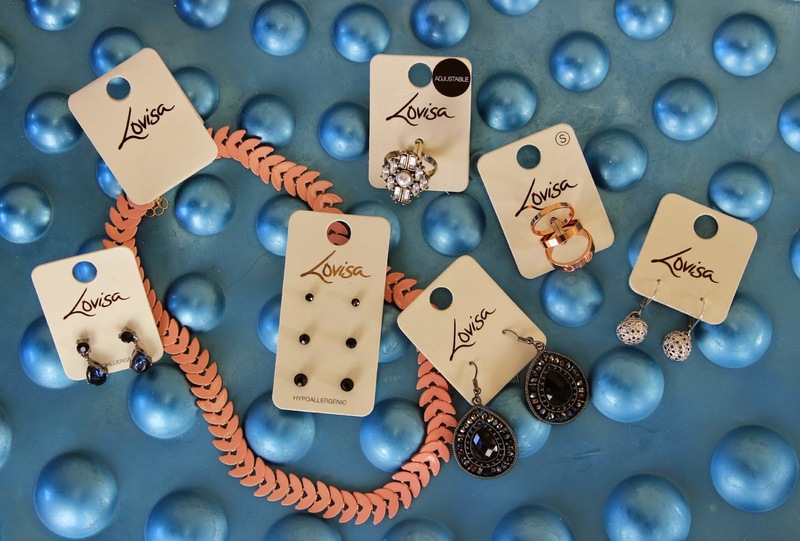 When I think about Lovisa I think of Accessorize, stripped back a bit to get a slightly more polished vibe, combined with the jewellery sections in the likes of Aldo and Mango. But, the prices are far better than all three of them. The main reason why I'm no jewellery addict is because I think that most of the time, they're so damn expensive. £12 for a necklace that doesn't go with everything? No thanks, £10 for one ring that I'll probably lose? I better not. This is where the multi deals and discounts at Lovisa caught my eye. The necklace itself was $10, so nearly spot on to £5. My Mum got the dangly earrings in the bottom left of the photo and the larger black jewelled earrings on a two for twenty deal, so only a tenner. As for the adjustable ring, set of 3 black studs and the intricate silver drops - they were on a three for ten deal. All three of them for 5 Great British Pounds. I have no complaints. Lastly I picked up a set of three rose gold band rings, which include a thicker one with Cartier-inspired engravings. I must admit, I tried that one on in the shop and had one of those horrible I-can't-get-this-off-I'll-have-to-get-it-and-scan-my-finger moments, but alas after a bit o' a struggle I managed to yank it off. That near death experience aside, they made it to my basket at $13, so I splurged on them at £6.50. So now? I'm all set up on the jewellery front. It was a good experience, and I'll look out for Lovisa next time I'm in Aus for certain. If you're one of my Australian readers (hello! you guys are loved) you can find out where your closest store is here. Unfortunately they don't sell online, but I'll be on the lookout and will mention on here if they ever do sell their beauties on the web. Before I go I must mention the sales lady who served my Mum and I at Lakeside Joondalup - I don't know her name, but she was a tall lady with long, dark hair and most distinctly: an absolutely humonguous bandage that had her entire right hand wrapped up. Despite this she wrapped the lot up so neatly and I was so impressed - and she was lovely too. I love encountering nice sales people! She said that she had accidentally slammed her hand in the car door so take note guys: don't do that. It looked very sore.